Ralf Schumacher and Juan Pablo Montoya dominated the French Grand Prix at Magny Cours giving the BMW Williams team its second 1-2 in seven days. It was a massacre and neither McLaren nor Ferrari could keep up with the swift blue and white cars. In the last four races Williams has picked up 65 points, Ferrari has gathered up 39 and McLaren has collected just 22. The battle is on for the World Championship and for once Michael Schumacher may not be the favorite... Williams has worked hard in recent months on all aspects of the FW25, but a lot of the advantage has been gained from the latest Michelin tires. They are fast, they are good in qualifying and they are consistent in the races. But most importantly Bridgestone seems to have no answer for them. Before the race the men from Bridgestone were keen to give the impression that they were not worried for the race. Qualifying had been a little embarrassing for Bridgestone and they hoped that the race would be better but those hopes did not last for long. When the lights went out the two Williams-BMWs took off towards the first corner leaving Michael to wallow around with the McLarens and the fast-starting Renaults. Ralf and Juan Pablo were not going to be beaten and Michael could do nothing about Kimi Raikkonen. He had enough trouble holding back David Coulthard and the two men went side-by-side through the first two corners. Michael was ahead and David had to fight to hold back Trulli and Alonso. By the time all of this was sorted out all that Michael could see was the back of Raikkonen. The two Williams-BMWs disappeared away quickly with Ralf able to pull out an advantage of 3.3secs in just four laps. Montoya knew from the start that there was no way that he was going to be a challenger unless something went wrong for Ralf. "I was not too comfortable in my car today," he said. "I was losing time in the third sector." It was not so much a battle as a BMW Williams parade and the balance of performance between the two men stayed the same in the first two stints, despite the fact that Montoya lost a small amount of time with a wheel nut problem during his first stop. Ralf had a small advantage and made the most of it. At one point Ralf had a lead of nearly nine seconds and then it shrank back to six and a half. But the balance of the battle changed after the second stops when Montoya found his car improving and Ralf found that his FW25 was more of a handful. "Maybe the tire pressures were wrong," said Ralf. "The car just did not feel good." Montoya came at him with great speed and as the third pit stops approached the Colombian was within striking distance. Montoya had to pit a lap before Ralf and it was that which made the difference. One more lap and Monty might have done it but Ralf managed to scramble out in the lead and immediately Montoya knew the game was over. He backed off and settled for a gentle run to the flag, so as not to put too much stress on the BMW engine. Ralf pulled away again. While the two Williams-BMW drivers duelled, the opposition was taking care of itself. The McLaren team made up for the first lap by putting Coulthard up to fourth at the first pit stops and he ran close to Raikkonen until the third stops came along. And then it all went wrong. The McLaren stops were timed to be a few laps earlier than those of the Ferrari and this was what put paid to Raikkonen as when he re-emerged from the pits he was stuck in traffic and lost vital seconds. When Michael Schumacher pitted five laps later he was ahead. "Third place was probably the best I could do," he said. "The car was as good as it could have been. We have a good car but so too has Williams and we now need to work very hard with Bridgestone to improve the situation." Coulthard would have been the man to take advantage of Raikkonen's troubles but his third pit stop was a disaster. When he came into the pits the refueling machine did not function as it should have done. The refuelers kept their heads and switched to the second refueling machine. The nozzle was just being pulled off the coupling on the car when the man with the lollipop signalled DC to go. It was a moment too soon and refueler Steve Morrow was knocked off-balance by the tire. David stopped the car almost immediately but Morrow was down, although he gamely waved that he was all right and that the car should go. By the time this was all done however DC was behind Schumacher and Raikkonen. In the closing laps Kimi lost a brake disk but he still managed to get to the line two seconds ahead of DC. McLaren had picked up nine points. Behind the McLarens and Michael were the two Renaults, but halfway through the third stint the pair of them ran into trouble at almost exactly the same moment, Trulli's engine began to misbehave electronically and lost power while Alonso's blew itself to bits in a more comprehensive fashion. It was the end of the story and a delighted Mark Webber moved into the top six. He stayed there until the end of the race. At the start Mark had made the most of the mistake by Rubens Barrichello which put the second Ferrari to the back of the field. Webber hassled the two Renaults and was hoping to get ahead at the first stops when the Jaguar ran out of fuel as it came down towards the pits. Mark lost probably two seconds but they were two vital seconds and when he emerged and the pitstop sequence was over there were the Renaults again. In the end Webber made it home to add another three points to his total. He is ninth in the World Championship behind the drivers of the top four teams. Antonio Pizzonia did a good job and for the early part of the race was running with Webber. At his second stop however he had a problem with the rear jack and lost a couple of vital seconds. He came out behind the Toyota of Cristiano da Matta, which was on a two-stop strategy and that ruined his chances. By the time the Toyota disappeared he had dropped behind Barrichello, Panis and Villeneuve. In the end Antonio finished 10th and could count himself rather unfortunate. Barrichello blew his chances at the end of the first lap when he lost control on a kerb just before the start-finish line and gyrated down the track. The rest of the field hurried by and then Rubens was off giving chase. He worked his way up through the field, switching to a two-stop strategy to try to make up places and by the end was up to seventh. It was a good effort in the circumstances. Local hero Olivier Panis had a good day - just for a change. He has never finished the French Grand Prix despite a career which dates back 10 years. But this time he did and picked up the final World Championship point for eighth place. He was fortunate in that his team mate Da Matta held up Pizzonia and so he was able to sneak ahead on strategy. With da Matta finishing 11th it was a good day for Toyota, a team which has not been very reliable to date. And then just to make David Richards's day, the bailiffs came back and tried to seize his cars for a second time. The rest of the cars were really irrelevant. Two laps down but running at the finish were the two Saubers with Frentzen 12th and Heidfeld 13th. Frentzen had been on three-stop strategy but there was a misunderstanding at the final refueling and he tried to leave the pit too soon. 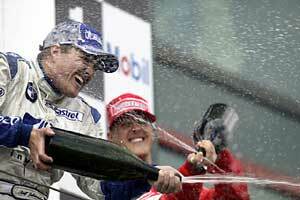 This cost him time but he still finished more than 20 seconds ahead of Heidfeld. "The two-stop strategy chosen for Nick was wrong," said Peter Sauber. Three laps down at the finish in 14th place was Justin Wilson who struggled through to the finish on a two-stop strategy and troubled by a transmission problem. Jos Verstappen in the other Minardi decided to go for a three-stop strategy and ran well in the early laps but a broken exhaust and a loose wheelnut meant that by the end of the race Jos had made five stops and was back in 16th. Between the two Minardis was Ralph Firman in his Jordan. He had planned for a two-stop strategy but had to stop again because of a bad vibration in the final stint. Still it was better than Fisichella who went out with an engine failure on his 43rd lap.